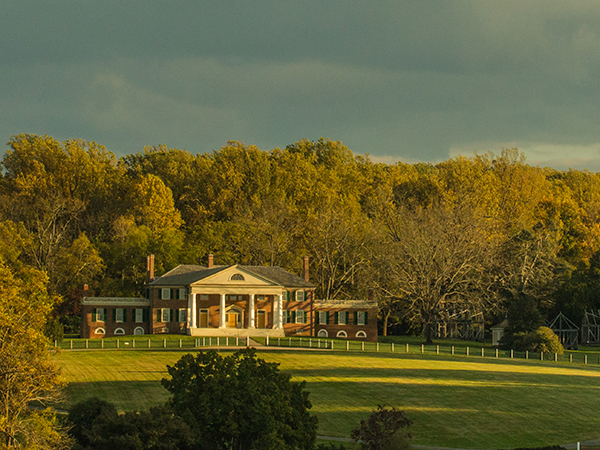 Built in 1763 on 4,500 acres of gently-rolling, wooded land in central Virginia, James Madison’s Montpelier was a working plantation with a formal landscape centered on the Federalist style mansion. 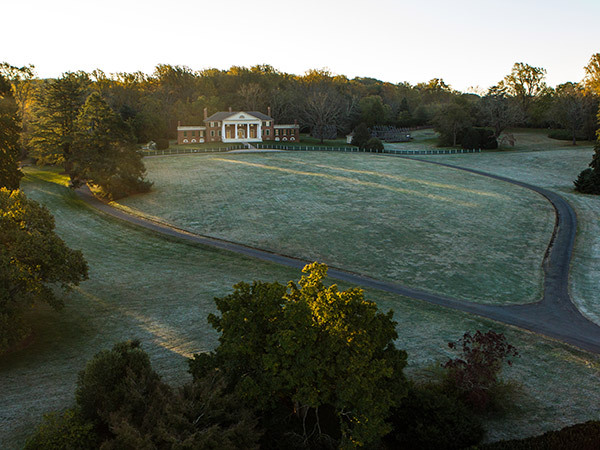 The landscape around the mansion echoes English park traditions, with broad expanses of lawn, native trees and sweeping mountain vistas. Behind the house, the family’s French gardener designed a four-acre garden with vegetables, fruit trees, flowers and shrubs. 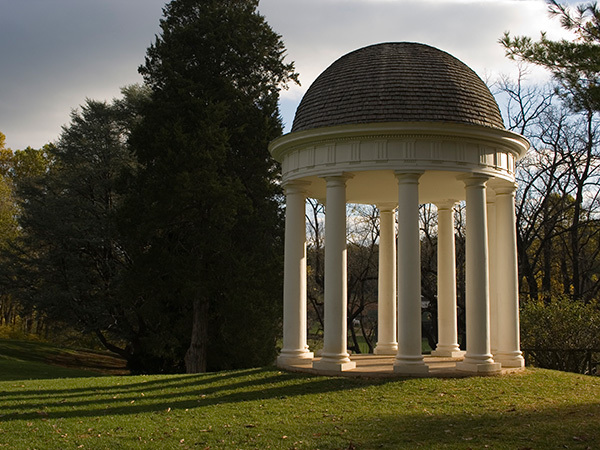 Madison also introduced black walnuts, tulip trees, and a large Cedar of Lebanon, which marks the entrance to the present formal garden. 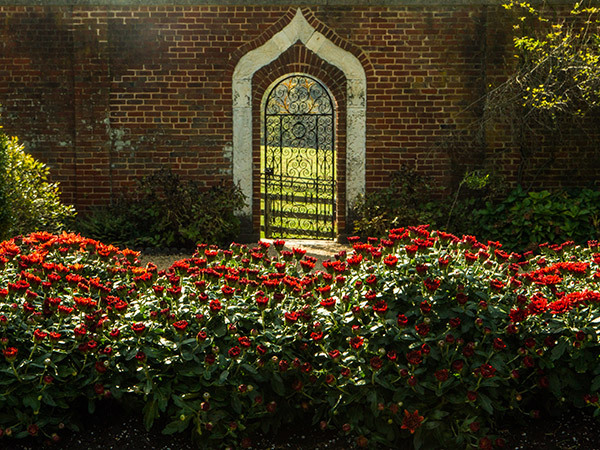 In 1901, Montpelier was bought by industrialist William duPont, who expanded the mansion and altered the entrance landscape with a circular drive and double rows of boxwood, exotic trees, ornamental shrubs and planting beds. 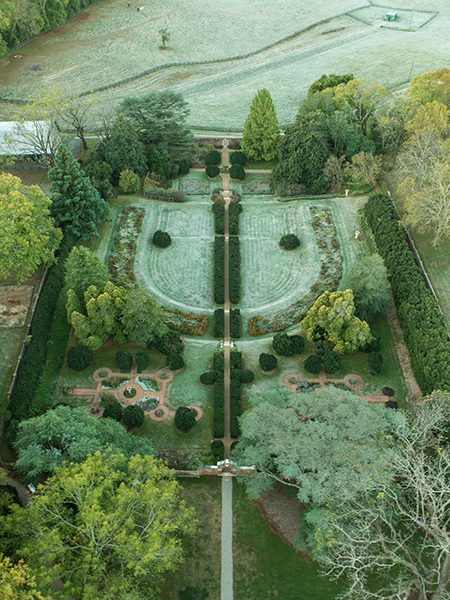 The duPonts also introduced a two-acre Colonial Revival-style garden atop the original formal garden, enclosed by a brick wall and featuring a strong central axis along a gravel walk. 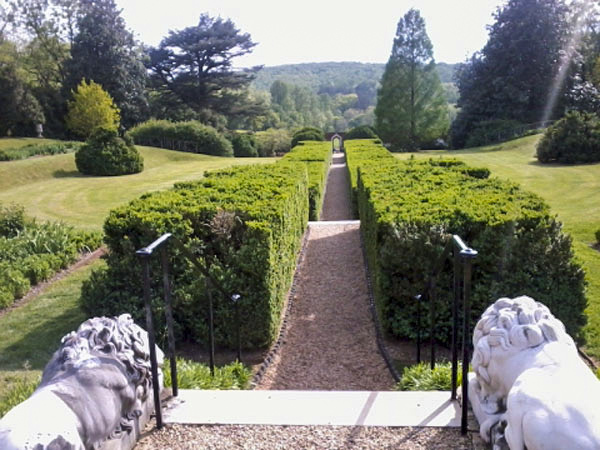 Outdoor rooms with medieval spolia radiate off the axis, including symmetrical herb gardens and terraced parterres. 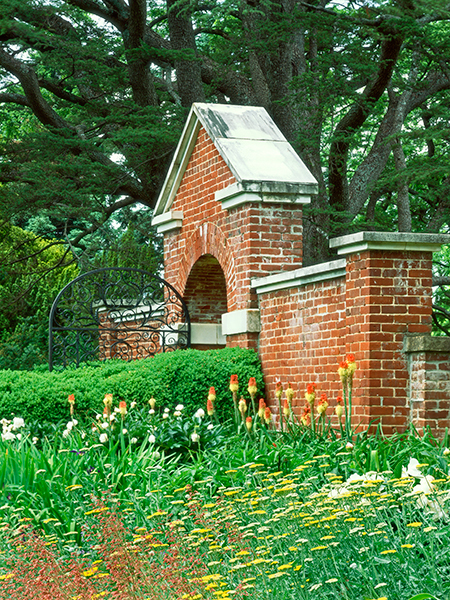 Charles Gillette inserted perennial beds in the 1920s, and equestrian elements were added later, including barns, paddocks, and a racecourse. 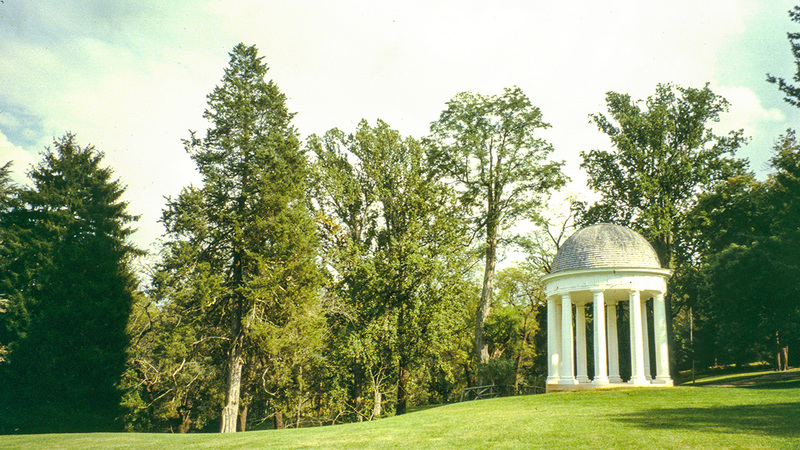 Montpelier was bequeathed to the National Trust for Historic Preservation in 1984. Today it comprises 2,650 acres, including over 200 acres of old growth forest. 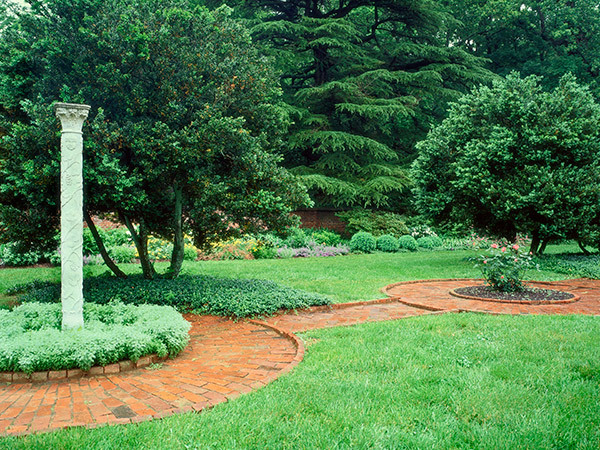 In 2003-2008, the National Trust returned the house to its Madison-era appearance, and the Garden Club of Virginia restored parts of the formal garden in 1992 and 2008-2009. It was designated a National Historic Landmark in 1960.